(FinalCall.com) - The devastation and destruction of Hurricane Katrina has shocked America and changed the lives of hundreds of thousands of people forever—from New Orleans to Houston, from Baton Rouge to Dallas and other areas in the Gulf Coast Region to other regions across the country. The current crisis has left many unanswered questions regarding Hurricane Katrina, the role and the response of the U.S. government and private relief agencies. On Sept. 11, the Honorable Minister Louis Farrakhan and a delegation from the Millions More Movement toured affected areas to begin a fact-finding mission and listen to the suffering voices of the survivors to truly understand the breadth and depth of their needs. 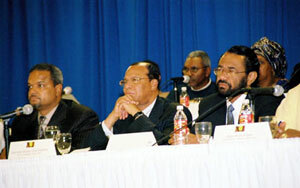 Minister Farrakhan described the day as a “whirlwind” mission, wherein he traveled to Dallas, for a private meeting with New Orleans Mayor Ray Nagin, who is currently residing with his family there; to Houston to tour the relief centers and listen to survivors at a town hall meeting; to Baton Rouge, La., to address an audience of clergymen and community leaders and finally to Jackson, Miss., to meet with many of the Black mayors of smaller cities and towns in that area that have been devastated by Katrina but ignored by federal relief agencies, as well as the media. In a press conference the following day in Charlotte, N.C.—the 17th city on his 23-city tour mobilizing the Millions More Movement, Minister Farrakhan informed of one of the most pressing issues discussed throughout the mission. “If they are evacuees, don’t they have the right to return, or are they being disbursed in a new Diaspora so that the other cities and towns can absorb this Black people, so that when New Orleans is rebuilt as a mainly White city, so that never again can New Orleans have a Black mayor, and Black police chief?” he asked. He also revealed to the press a report that he received, from a “very reliable source” he said, that there was a 25-foot hole under one of the levees that broke, which suggested it may have been busted on purpose to destroy the part of the city where Black people lived. He reminded the press of the only time that bombs ever fell on the soil of the United States—May 31, 1921, the bombing of “Black Wall Street” in Tulsa, Okla., one of the most economically prosperous and independent Black communities ever developed. He recounted that an incident over a Black person “insulting” a White person was fabricated and fomented the farmers’ hatred and envy enough to take to the skies in their planes and drop bombs to burn the Black community to the ground, killing 300 people and wiping the entire district off the map. The United States has some “very wicked people in high places if you look at our history,” he added. Upon their arrival in Houston, Congressman Al Green (TX-9) warmly received the Honorable Minister Louis Farrakhan and the members of the delegation for a tour of the George R. Brown Convention Center, which is one of many locations where survivors are given relief assistance. The Millions More Movement delegation included Dr. Julianne Malveaux, Bob Law, Attorney Malik Zulu Shabazz, Minister Akbar Muhammad, Reverend Willie Wilson, Dr. Barbara Skinner, Erykah Badu, Charles Steele and Minister Benjamin Chavis Muhammad. Chief of Staff for the NOI Leonard Muhammad, who had been in the city for nearly a week prior conducting research and preliminary fact-finding meetings, he joined the delegation on the ground. As the delegation toured the living area, the sight of Minister Farrakhan brought smiles to lonely survivors who shared their pain with him. Evacuee Michael Jackson approached the delegation to request help in finding his two missing girls and Minister Farrakhan talked with him on how it can be accomplished. As word of Minister Farrakhan’s presence in the convention center spread, the crowd around him grew, as people wanted to share their stories with him. He hugged teary-eyed survivors, shook hundreds of hands and stopped to make prayer with others. 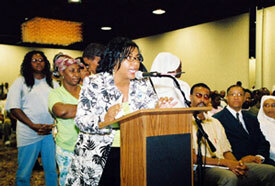 After the convention center tour, a near-capacity crowd filled the Power Center for a National Town Hall Meeting to hear untold stories of fear, anxieties, survival and heroic efforts from those affected by Hurricane Katrina. Survivors were bussed from the Astrodome-Reliant Center and the George R. Brown Convention Center to share their personal spiritual, psychological and economic challenges and traumas to the panel of leaders who were focused on hearing their pain. From whence cometh their help? Another survivor, Shaun, shared that he did what he had to do in order to escape the horror of the hurricane. Story after story of fear and pain were shared. Maria Farrakhan Muhammad, the National Directress of the Louis Farrakhan Prostate Cancer Foundation, traveled from Chicago to attend the townhall meeting. She told The Final Call that she felt compelled to get up out of her seat and go to the podium to hold and comfort a love lorn mother who was missing her child. “I had a two-story home with two-and-a-half bathrooms and everything is gone, it’s underwater. I’m still missing a son, I’m having crying spells for no reason,” the mother lamented. “I’m trying to find my son. A mother’s love is deep,” she cried. Sister Maria stated that, as a mother herself, she felt the woman’s pain and had to rush to comfort her. After listening to several more reports, Minister Farrakhan addressed the audience with sincere compassion for the survivors of Hurricane Katrina. He expressed that it was an honor to listen to the survivors, the stories of which he said are inspiring to him and the delegation. He then pledged that the Millions More Movement will do everything in its power to ease the suffering of our Brothers and Sisters. “There has never been progress or advancement in society, science, religion and medicine without the loss of life. It seems as though, in the plans of God, some always die that others may live,” he explained. “This is a trial of great magnitude, not only on the citizens of Louisiana, Alabama and Mississippi, but this is a trial on the government of the United States of America—local government, state government and federal government. This is also a trial on those of us who are not afflicted—but are afflicted because you are afflicted. He stressed that it is not enough for people to just send some money, shoes and clothing, and insisted that people must not simply watch and do nothing. “I’m not talking about television cameras. I’m not talking about press conferences. I’m not talking about eloquence of speech. What I heard today does not need talk but something needs to be done,” said Minister Farrakhan to the leaders present. He revealed that millions of dollars are being allocated to companies to clean up the debris in New Orleans, but urged the importance of able-bodied men from our community to return to the city and get involved in the rebuilding process. “We have to be proactive!” he declared. He also pointed out the need for Black contractors to become a part of the rebuilding process. Members of the panel who joined the Millions More Movement delegation included Congressman Al Green, Leonard Muhammad, Mayor Frank Jackson, Kofi Taharka, Councilmember Ronald Green, Deloyd Parker, Jim Jones of the Diplomats, Rev. Dezee Coldfield, State Rep. Alma Allen, State Rep. Al Edwards, Minister Willie Muhammad of Muhammad’s Mosque No. 46 in New Orleans, La., Lateef Salley, State Rep. Garnet Coleman, among others. After leaving the survivors with a message of hope and encouragement, the delegation traveled to the campus of Southern University in Baton Rouge, where Minister Farrakhan spoke to a crowd of over 300 people, which included community leaders and educators and concerned citizens from Baton Rouge and surrounding areas. Minister Farrakhan spoke about the plan of Allah (God) as it related to the wickedness of America. Referencing the scriptures of Paul, he said, “We war not against flesh and blood, but against principalities, against powers, against the rulers of the darkness of this world, against spiritual wickedness in high places.” He taught that God’s plan is the destruction of the wicked who rule however, he noted, the primary victims of Hurricane Katrina are Black people. He also announced the plans of the Millions More Movement to form an oversight committee of the country’s charities, and informed that he had received a report that the levy system in New Orleans, which keeps surrounding waters from flooding the city, was purposefully destroyed to save the business district and affluent areas of New Orleans. To the doubtful, he advised not to put it past the wicked to allow thousands to die for the benefit of the wealthy who rule.